If you’re like me, you are always either sending a text message, composing and e-mail, or commenting on your social network of choice. Although the iPhone has an abundance of integrated applications that claim to make your life easier, we all know, that’s not always the case. Apple has paved the way with their innovative products, but in the end it is the jailbreak “artist” who uses input from the community, to perfect the users experience. The following list is composed of my top 5 Cydia tweaks and applications, geared toward SMS, e-mail, and social networking. QuickReply For SMS simply allows users to reply to a text message, using the native iOS Messaging app, without leaving the application you currently have running. You receive a notification as normal, but upon selection of the ‘Reply’ button, what is essentially a transparent version of the messaging app allows you to quickly reply to your message, and get back to business without ever leaving from where you started. My favorite ‘pro’ to this handy tweak, is that it can save you loading time when you happen to get an SMS while browsing Cydia. 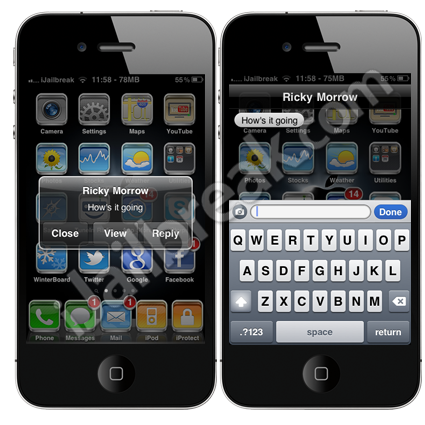 QuickReply For SMS is available for $2.99 through the BigBoss Repo. Mail Enhancer is a feature rich, ‘as it should be’ version of the native iOS Mail app. It adds an unprecedented list of different options to your iDevices Settings application and allows you to delimit the integrated settings to a whole new level. From customizable pop-up notifications, to a colour coded inbox, to a lady who kindly reads you your notification right from your pocket, this tweak is absolutely amazing. For those who opt, you can even compose your e-mail using HTML. ManualCorrect Pro makes life with the iOS AutoCorrect feature a bit more manageable, without fully disabling it through your Settings app. You can now have the option to continue with the word you typed initially, without it ‘AutoCorrecting’ to the first word the iOS dictionary defaults to. You can, however, still choose the corrected word by simply tapping the AutoCorrect suggestion. You can also keep certain words from being corrected by adding them to your dictionary. 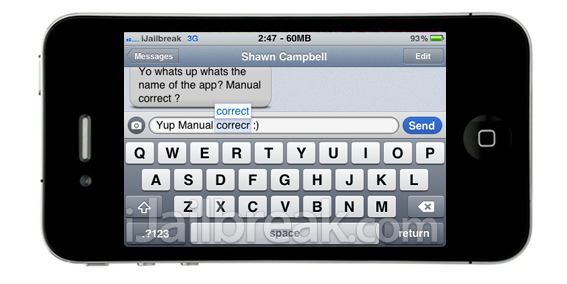 ManualCorrect Pro is available for $0.99 through the BigBoss Repo. You can also grab ManualCorrect, the free version which lacks the custom correction settings. Attention Twitter addicts everywhere! TwitkaFly enables you to QuickReply to Twitter.app push notifications, and tweet directly from your SpringBoard using the Activator command of your choice. 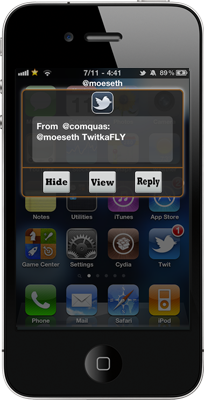 A very easy to use tweak, with a great user interface and seamless integration with your Twitter application. If like me, you are always too busy to answer your phone, I’m Busy SMS is a great buy. With I’m Busy SMS you can politely ignore an incoming call, and configure your device to automatically reply to the number with a text notification of your choice. This app has proved useful in my busy daily life countless times, and I highly recommend it! That concludes my top 5 Cydia messaging tweaks.. For the latest and greatest on anything and everything “i”, keep your screen glued to iJailbreak.com! Thanks for reading. How does I’m busy SMS play with CallBar if it does at all? Unfortunately none of the apps or tweaks listed above are currently supported in iOS 5, however, both the QuickReply, and Mail Enhancer tweaks seem to have their own integrated counterparts in iOS 5. Do you know if any of those work on iOS 5? Thanks! May I ask how can I paste my own pictures in a fake iPhone like this? why is biteSMS left out? I think it is the best SMS replacement App. I just simply can’t do without it, and on top of it all, it is FREE. It is free if you don’t mind seeing ads. I have it and really liked it until the last update. It now will not let me reply to a message without opening the app, unless I’ve received more than one or I’ve missed a phone call. I mentioned this to them several months ago and they have not fixed it yet. what can i download from here to change my sms text background/ colors? also, is there a way to change the small battery life symbol at the top right hand corner? Thanks!